Bernice Bartlett talks about meeting and marrying her husband Harry Golding aged seventeen. 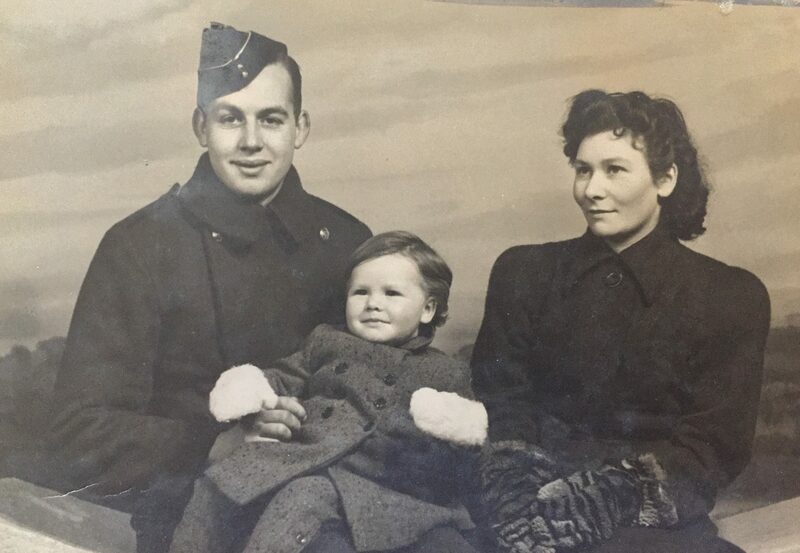 She remembers how Harry was reluctant to join the Army as he did not want to leave Bernice and their first-born son, Bernard, and how Harry never met their second son, Barry, born in 1943. 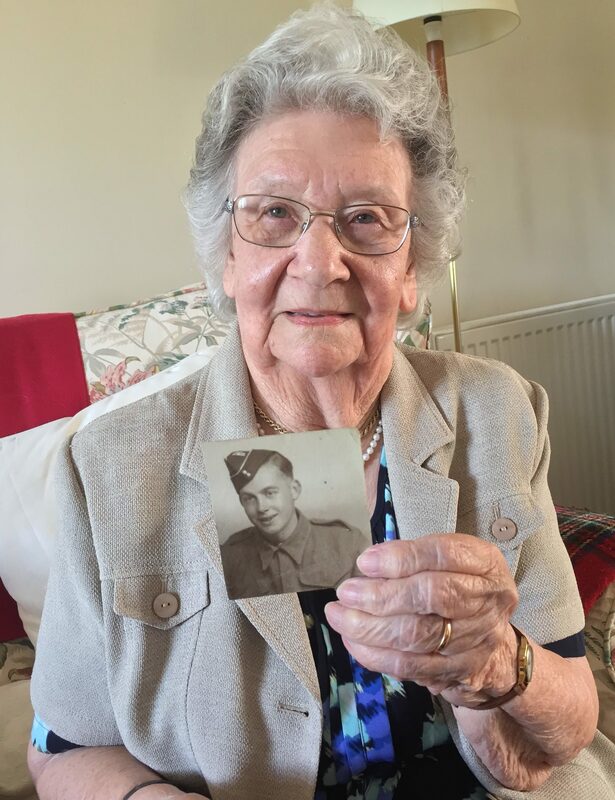 Bernice talks about living in Maidstone with her mother (also a widow) during the war, and recounts the day she received the letter telling her that Harry had been killed by a booby trap near Florence in Italy, as well as visiting his grave forty years after Harry’s death. Bernice describes her life running country pubs with her second husband, her large family including four children, eight grandchildren, eleven great-grandchildren and one great-great-grandchild, and her many hobbies, including playing bridge and whist. This interview was conducted by Nadine Muller on 12 May 2017. Today is the 12th May 2017. Could you tell me your full name and your age, please? Bernice Lois Bartlett. And I’m 93. Thank you. Would you like to tell me something about your childhood, Bernice? Where were you born? Where did you grow up? I was born in Lichfield in Staffordshire. My father was a soldier, so I was born in the barracks, as you might say. We then went to Egypt for a short while, and then I came back to a place called Ashford, Kent, and grew up there. My father was a publican when he came out of the Army, and I had quite a good childhood, really. I only had one sister and she was twelve years older than me. So, I suppose I was an only child as such. We lived at the Flying Horse at Wye, which is a lovely old coaching inn. It was country living. We played in fields, not like children today, we were always out somewhere. When I went to school, we had a school bus from Wye to Ashford. I went there, and then we moved finally to a place called Langley. We lived at the Plough at Langley. My father was still a publican, and that’s where, at 16, my father died, so we then left there eventually and lived in Maidstone. By this time, I had met Harry, my first husband. We went to all the dances there were then, and again quite a nice life, I suppose. Every Saturday night we were off somewhere to a dance, called the sixpenny hop then. As I said, we moved to Maidstone, and of course that is where I married when I was 17, so married life started quite young. Can I take you back for a second, please? Do you remember much of when your father was in the Army? So, you said you went to Egypt when you were young? When was this? What age were you? I was a baby. Soon after I was born we went to Egypt, and no, I don’t remember it. Not long after that my father came out of the Army, and that’s why we came back to Ashford to live for a while and then moved to Wye, as I’ve said. Do you remember the year that you met your husband-to-be? It must have been 1940. In the village dance. It’s still there, an old barn in a place called Langley. There was a local band, and we just knew everybody, and, as I said, I met him and from thereon, we stayed together, and that was it. How old was your husband then? So, you were both quite young. We were both young, yes. So, how, if you don’t mind my asking, did your courtship go? You went dancing, of course. Yes, we went dancing. Of course, the war was then on, and he was going to be called up at some point, and we wanted to marry before he went away because that was the done thing then. So that was one of the reasons that I suppose we did get married so young. But then he didn’t go until we were married. We had Bernard. Bernard was about eight months old, I think, when he finally went into the Army. Harry Golding, Bernice, and their first-born son, Bernard. C. 1941. That would have been 1941 … 1942 … 1941. He hated it. Nobody hated the Army more than he did. He did not want to go. He was stationed in Norfolk, a place called Downham Market, and I did go up there for a week to see if he would settle down a bit, but he never did. He never did like the Army. Never wanted to go, and the thought, when it came, that he was going to have to leave on his embarkation leave, I think he would have done anything, really, rather than go. But the fact is I came from an Army family. My bringing up was “You have to go”, and so that was it. At that time, by time he had gone away, I was pregnant with my second child, but he never saw him. He was born six months after he’d left. So, he didn’t see his second son. Then of course he went to Africa and then to Italy. He went into Anzio and, apparently, that was dreadful, by his letters. You know, the bombing was dreadful then they made this journey. I’ve gone through this journey so many times on the map because, although he was killed near Florence, I never knew where. We have gone out so many times to try and find out … because he was buried somewhere else first. 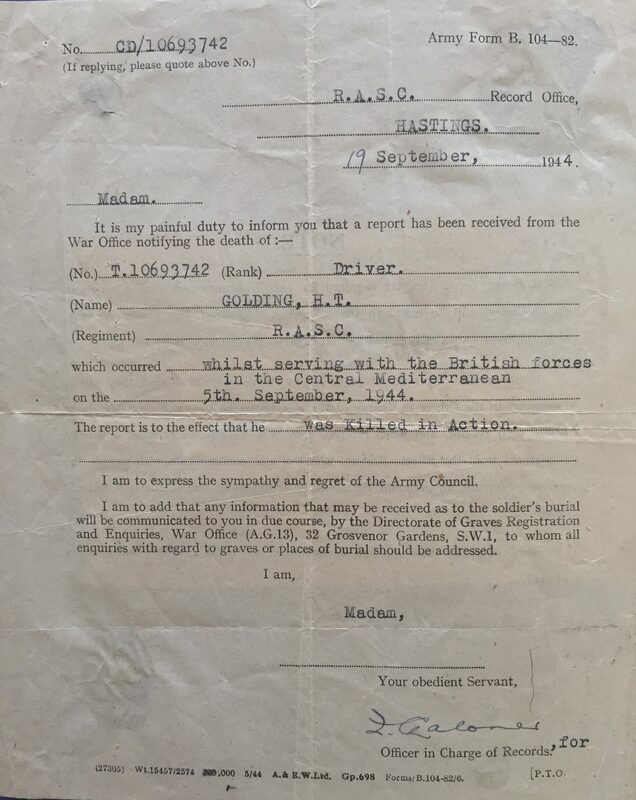 I’ve gone through all the usual channels to find out where that regiment was on that day, and that particular day there is no record of where they were. We used to go out with his photo and look at all these villages around to try and picture where this photo was taken, but we never did find it. Of course, he’s buried now in Florence cemetery. They moved him. So, when was the last time you saw him? I saw him … it must have been 1942. It might have been just before 1942, before the Christmas. Yes, that was it, because Barry was born the following September. Yes. When did your husband die? He died September 5th 1944. So, how was it for you with one child, and you were pregnant with your second when he left in 1942? Well, I was living with my mother at the time. My mother had a house. My mother was a widow, and those days, widows only got ten shillings a week. So, my mother was happy to let me stay there because we didn’t get a lot of money then. I think it was about four pounds ten shillings in old money we got. So, I stayed with my mother. As soon as I could, after that, I had to get a job because the money wasn’t enough to keep us. So, I got a job, because I had never worked really, because I had stayed at home. My parents having a business, I always stayed home and worked at home. But I got a job in a hotel reception. It was lunch times, which suited me because of the two children. My mother looked after them, but then in the evening of course I could put them to bed and see to them before I went out in the evening and worked until about ten at night. Then I used to have to come home … sometimes there was an air raid on. I would be coming home with my hand on my head. That was never going to save me. I sometimes think, “What was I really thinking about?” But I always had my hand on my head, as I hurried home with an air raid going on maybe. Maidstone didn’t get bombed an awful lot, but we did get the stray … because the planes came over us and we could hear them. 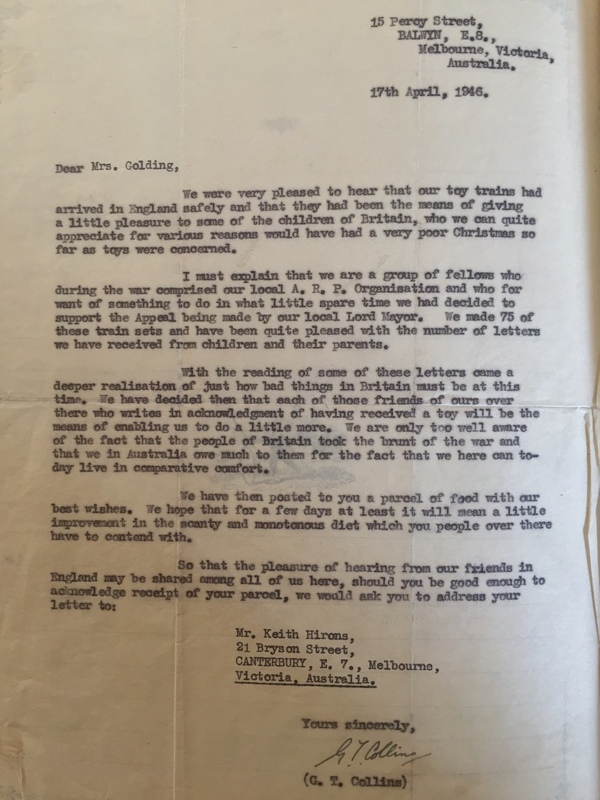 When I used to go to bed at night, and I did because I wouldn’t take my children down the air raid shelter … We had an air raid shelter in the garden, but I wouldn’t take my children down there because my youngest had asthma, so I wasn’t going to expose him. So, I just used to go to bed with them and think, “Well, if it hits us, it’ll hit us all because we’re in the same house”. We did actually have a bomb on the opposite side of the road. It brought the house down, but it didn’t explode. Well, I don’t think it properly exploded at all. It brought the house down, but there was not a big bang. We knew it shook the house when it came down. Did you take your job at the hotel after your husband left, or after he died? After he died. Yes. I suppose not long after, probably. Three months, six months. I know it worked, the hours worked very well for me because of the children. And of course we began to get the doodlebugs then. They were coming over. You could hear the doodlebugs coming, and then the engines would shut out, and you knew it was going to drop somewhere, but you never knew where the doodle bug was going to drop. Maidstone was quite lucky. They escaped quite a lot really. I was offered to go to Scotland with the children at one point because they were evacuating people, but I couldn’t really leave my mother behind. My mother was on her own and I thought, “Well, I can’t leave my mother”. So, I didn’t go, but makes you wonder if life would have been different if I had. You don’t know, do you? Your mother wasn’t a war widow? No, my mother was a widow at 49. My father did die from the results of the First World War because he had been gassed and my father died of TB [tuberculosis]. So, I suppose by today’s standards she would probably be classed as a war widow. Do you remember much from when your father died and your mother was widowed? How did your mother cope? My mother coped quite well. She was not a well person. She hadn’t been for many years, she’d had cancer. I don’t know. I suppose my problems outweighed hers, really, because I mean my father died in 1939, but I had always stayed with my mother. So, your father died at the onset of the Second World War as a result of what he had been through in the First World War? Yes, and strange, because my father had his calling up papers come through, and he would have loved to have gone back to the Army. My father loved the Army, and he would have loved it, but of course he was a sick man by then. Of course, he couldn’t go. I think, my father was a soldier, that was his career. He loved the Army. Wherefore Harry did not like the Army. He was not a soldier. He did not like the Army. What was your husband’s full name, Bernice? Do you remember his letters? You said he wrote you letters from abroad? Well, the usual things, I suppose, about times when we went dancing, and when he came home, what we would do. You know, times would be different when he came back, and obviously he talked about the children. I suppose really, most letters, that was what it was. It was just every time reminisces about what we’d done before he’d gone away. You know, he would soon be home and we would go dancing again. But of course they could only have so many letters. I think it was probably one a week or something like that. Then I had a couple of cards come when he couldn’t write to say that he was well, but they of course couldn’t write because they were somewhere fighting. Because he was a despatch rider, Harry. He rode a motorbike and took messages to the front. I had a letter from his officer after he had died, which I can show you there, to say that he always did what he was asked to do. It’s very strange, really, because he’d been gone … what … two years probably, when he died, I think. Yes, it must have been just after … Nearly two years he’d been away. So even though he never wanted to go, he clearly did his best when he was there. Oh yes, oh yes. He did the job he had to do, but it was always, “When I come home”, you know. No, he didn’t take kindly to the Army, not really. It’s not something he would have chosen to do, no. Just because he didn’t want to leave us. That was the reason. He just didn’t want to leave us. That was his one thing. He was leaving home. I know we went to London to see a cousin of mine, whose husband was also on embarkation leave, because they went from Scotland, that’s where their boats went from. I can remember going for the day and them talking about having to go away, and [it was] not really what they wanted to do, [it was] what they had to do. I suppose in a situation when it’s war they do what they’re asked to do. Do you remember the day and how you heard about Harry’s death? Do you remember what it said in the letter, the first one you got? Yes, he told me that he’d been killed by a booby trap, and he’d been buried. They buried him with military honours in Italy, very near where he was killed because at that time the war was pretty bad. At that time, they were getting near to Florence, to take Florence, and we’ve been to this village where he was stationed because he was attached to the ambulance section. I don’t know why that was, but that’s the attachment. We did go there and that is where they had been the day before, but they had moved on for some reason. So, that’s why we could never find out. We knew it was around there. It was around there somewhere, but even the War Office they couldn’t tell us, because I had tried. Even talked to some of the men who were with him. He has died now, but he knew Harry, and he said he couldn’t remember, because they were moving up so quickly at the time, he couldn’t remember exactly where they were. He knew near enough where in the area, but not the exact spot on that particular day. So, I would always have liked to have found where that first grave was because we had a photograph come, and I did write to … The British Legion have a magazine. They have letters in there, and I did write there, five years back, put Harry’s photo, did anybody know where they were that day, and where they could be buried? I did have an answer from … somebody rang me … and he said that is Florence cemetery, but it wasn’t Florence cemetery. He had obviously got the same photograph, because when I looked at the grave next to Harry where he’s buried the first time, the man is buried next but one to him in Florence. So, they moved the five of them, obviously, but it is not Florence. The photograph doesn’t … well, it can’t be because they told me it was different, and I had confirmation that it was different, so. We’ve been out with the family and we looked all around. Bernard and I have looked, but no, couldn’t find it. So, you come from a military family? But I suppose that still doesn’t prepare you for the day that the letter comes. Oh no. No because I just didn’t expect it. The letter came, the ordinary blue envelope, and I put it on the dresser. I didn’t open it because it was the children’s tea time, and I was getting the children’s tea time and I thought, “Get them done, put them to bed, then I’ll read my letter”. Of course, I didn’t realise what the letter contained. Of course, when I read the letter, and … I mean it comes as a shock. In a way, you don’t expect it somehow. You don’t think it’s going to be you. That’s the strange thing about it, I think. I hadn’t actually put the children to bed. I had got them ready for bed because I can remember Bernard being there. He was a three-year-old then. Of course, he couldn’t understand why all these people were around, and, you know, his mother was upset, and so I hadn’t actually got them into bed when I opened it. But you just don’t think it’s going to be you, I don’t think. What did you do once you had read the letter? I went straight to Lou’s, to his foster parents, or adoptive parents. He had been adopted, Harry. I went straight to her. Then at Lou’s, she was out, and his father was there. I told him, and he just walked away. Then, I can remember her coming in and, of course, I was upset. She looked at him, “What’s the matter?” I can remember him saying, “The boy’s dead”. You know, it was quite upsetting, really. Then of course she came back with me to my mother’s. The neighbours … because, you know, you knew people around and the neighbours came, and I mean the daughters next door, their husbands were in the Army. You know, I think it sort of brought it back to them, and unfortunately her husband was killed later when they went into France. So, as she had come in to me, I had then gone in to her when hers was killed. I think people, they tended to sort of stick together more then, I think. They weren’t so busy as today, or else it is war time and people are closer, I suppose. Did you get a sense that there was a community around you? Yes, you feel people who knew you and, obviously … Particularly, I can remember the midwife that we had when Bernard was born. And he was born in the night, and Harry took her home … because people walked then everywhere … and Harry took her home about four o’clock in the morning and kissed her and thanked her for what she had done. And she was really shocked when she heard that he’d been killed. But I suppose people don’t expect it. I also wrote to the people that we stayed with when I went to stay with him when he was stationed in Norfolk. We stayed with this elderly couple, and they gave us such a lovely week, and I had to write and tell them. It’s doing those things, I suppose, that brings it more and more closer. Because it doesn’t seem real at the beginning. Then it begins to become … it’s true … because although you haven’t seen them for two years they are still there. Then suddenly you have got to realise that they are still not there. And you can’t, still, because you still don’t … It’s very strange. It’s still very difficult because I wasn’t there. I didn’t see him buried. And you still can’t sort of imagine that they’re gone, really, in a way because you haven’t seen. Normally, you see somebody buried, you go to a funeral service, and it’s reality. But that … you don’t see. You’re just told something. You didn’t have that process of closure. Is that why you felt you had to go over to Italy? Oh yes. Well, at the time, I mean, I said, “Well, one day I will go to his grave,” never thinking I could because obviously then there wasn’t travel. Not then, not as there is today. People just didn’t travel. But I did say that I would go, and it was after my second husband died, and then Bernard took me. We went there, and I’ve been ever so many times since then, yes. I made a point of going every other year. The whole family went, second family. Everybody went. I mean it’s a beautiful cemetery, Florence, and beautifully kept. But it’s graves. You didn’t see it as a grave somehow because you didn’t see a funeral, you didn’t see anything. No, but they are graves. It’s very sad to see them all really, because there’s so many. How and when did you tell the children? Because your eldest son was only just three? He hadn’t known his father much, really? No, he didn’t. Bernard says he remembers him. Bernard said, “I remember sitting on his lap”. I’ve got the photograph of him sitting on his lap. Bernard said, and three, you think … but knowing I’ve got a little three-year-old great granddaughter, who’s very bright, and she has an incredible memory. I think Bernard probably does remember. You don’t think a three-year-old would, but he says he does. It’s difficult to say. You can’t tell them at that age. It was always, “Well, that was your daddy”, you know, sort of thing. You can’t exactly say. This was your second son. So that was not long at all after your husband passed away. No. Well, Barry was a year old when his father died and yes, he died when he was four and a half. I didn’t think then … I think the world has got nothing more now to throw at me. But Bernard said, if you want to, he would talk to you if you want to talk to him. I suppose maybe he knows what it’s like growing up. Although he grew up with a step-father, it’s not his father. Bernard goes to Italy sometimes lecturing and that. So, he gets the opportunity of always going to the cemetery. So, you had been told by those two letters that your husband had died. You had to tell his parents, the people that he had known. What did you do then? Was there any support? You said you got a job at the hotel fairly quickly. The strangest thing was, and sometimes I’ve gone with the British Legion on a visit to Italy and I’ve met other widows, and we’ve all talked and said, “We had no support at all. Nothing.” When it came it was, “Dear Madam, we have to report …”. A girl of 21, “Dear Madam.” There was no feeling there, it was, well, we’re just reporting, but we had no support. Nobody came. I mean we just had to get on with it. The strangest thing was also: my money, that had been four pounds and ten shillings, when Harry was killed, and for goodness knows why or for what reason, was dropped to three pounds and ten shillings. So, they obviously thought we lived on less. And there was absolutely no support. I wondered if it was just me thinking that, and I talked to them, and they said, “No, we had no support at all”. So, it was just a matter of, well, get on with it. Which we did. So, of course, as you say, there was no such thing really as bereavement counselling, anything like this. How, if at all, did you find out about any pension schemes or anything like that, the War Widows’ Pension? I think probably the War Widows’ Pension came automatically. I think that was when I had one pension, and then probably when the War Widows’ Pension came, it had dropped down. No, there were no schemes to … I mean, I had to pay my mother £2.50 for our keep, and I had a pound a week left to get the children’s clothes, any little extras they wanted or anything. But no … We knew what it was, I think, to be really short of money, and just left. As I say, I had had to get a job, which I did. I went to work. You wouldn’t have been able to live on the War Widows’ Pension? No, you couldn’t live … Obviously I didn’t want to carry on living with my mother, and of course you couldn’t get anywhere to live then, it was almost impossible. I used to walk around Maidstone looking to see if I could see empty flats or something somewhere. I couldn’t have left mum, well, I don’t know how I would have lived if I had, but I just wanted to be independent, really, and stride out on my own. There was nothing at all. You just could get nothing. I went to the council and asked if I could go on their list for a house. And I was told, “Oh no. We’re keeping the houses for the men coming home”. I said to the girl, “Well, what about us that’s got no men coming home?” She said, “Well, that’s the rule”. So, that was the rule. So, I stayed with my mother until I married the second time. So, you lived with your mother because your husband had died, you got your War Widows’ Pension, and then you got the job at the hotel. You said the hours were convenient with the children. So how did things work out whilst you were working? Well, I worked from twelve ‘til two. So, my mother had the children for the two hours. Then I used to take them out in the afternoons, and then go to work at seven in the evening until ten. So, they were in bed before I went out. I think if I remember rightly, I earned two pounds ten shillings a week, yes. And to me that was a fortune. When you think of the cost of things that they were then. That meant you could make do? Yes, I could. Yes. I could get by then. I know you said you met other war widows via the British Legion and your trips to Italy with them. Did you know any other war widows then? Was there any kind of community? No. I didn’t know … Living in Maidstone, no. I didn’t know anybody. I know the night that when peace was declared, I was working, and all the crowds in Maidstone were all out. The streets were full of people rejoicing, obviously. The war was out. I walked home after working and thinking to myself, “What have I got to celebrate?” Everybody was in the streets, but no, I didn’t know. The only time I do know, the only other person, was two years afterwards, or a year, probably not two years after, probably a year, when we went back into France. The girl that lived next door, her husband was killed when they went back into France. Other than that, and even now, I very rarely ever meet a war widow. I mean there must be … I’m sure there’s lots around … But I go out, I play cards, I go to whist drives or bridge drives and play cards and I never meet anybody that’s lost their husband. How did people react at the time when you realised you had lost your husband in the war? Well, I don’t think they did, really. I think it was a war that was on. My mother wasn’t a very feeling woman, so I never got a word from my mother that she was sorry. My mother was not that type of person. She was quite hard. No, I think it was almost, “Well, you carry on”. You know, the war was still on, everybody was … In our particular road where we lived, they were sort of older people, there weren’t many men, I don’t remember any men going from there except for next door, but her husband didn’t come from Maidstone anyway. He came from away. She met him because his regiment came there, so that was the only other one. They actually asked me, my sister did one day, my mother and her had obviously been talking, and my sister, we were upstairs in the bedroom doing something … I was very close to my sister … And she said, “Have you thought about having the children adopted?” I said, “No, I would never do that”. And I couldn’t really believe that they had even asked me. I suppose they thought I was young, with two boys, but I would never ever have thought of that. No. It was really a very strange time, really. So you worked at the hotel for how long? Do you remember? I was there until I got married again because then very often when you got married they didn’t want you in these jobs once you were married. So, I was there until I got married again in 46, yes. When the war was over. Did you lose your war widow’s pension? Yes. But Bernard did go to a private school. I fought for that because that was our ambition, that was what we talked about. We were going to go into the licensing trade and we said that, you know, we’d educate Bernard. So, I did fight for that and I got proof from the brewery that we had approached them, and Bernard went to a private school until he was eleven, and then we moved to Sheerness, and there wasn’t one on the island, actually, private school of any sort. So, he went to the local school and the head master said to me that Bernard was well ahead with his maths, a bit behind with English, but not that much, and the 11 Plus was coming up, so I would be giving him a little extra push where English is concerned. Bernard was the only child in that school that passed his 11 Plus. He was allowed out of school to come home to see us, to tell us. I can remember him now rushing in to tell us that he had passed. Because Bernard was always ambitious. It was his aim to go to university when not so many people went, when Bernard went. It was always his aim to go to university. He went to Pfizer’s for a while, too. Pfizer’s would have put him through the university if he had done it their way, which was a year at university then a year working, a year … And Bernard went, “No.” He wanted to go to university, and he did. And that’s one of the big regrets that he couldn’t tell his father what he had done. Of course, he’s done very well, hasn’t he? He’s a Professor of Chemistry at Newcastle? Yes, and he won’t retire. No, I mean, he’s up at six every morning, off to work. Loves his job, Bernard, loves doing what he does. Yes. Could you tell me about when you met your second husband? The Star Hotel in Maidstone. Yes, I mean because I wasn’t looking for a husband. We just met. He was working there. He had come out of the Army. Well, he had been in hospital eighteen months in Egypt, and brought back here to have bone grafts. And he was working there. It was just … So that’s how I met him. I think the people that worked there, they used to tell everybody, “Our cash,” they always called me because I used to do the cash, “Our cash is a widow. She’s got two little boys”. They used to tell everybody because my boys used to come to meet me, so they all saw the children. Yes, he still limped quite a bit, my second husband, when I first … Well he always had it. I saw it. He still did limp a bit. Do you remember when you first saw him? Yes, well, just working because I was in the cash and he was there in the hotel. Yes, well, I went out with him a couple of times, and it came up about I had been brought up in a pub. I had always worked, that’s what I always did. I had said, you know, that’s the only life I really know, that’s the life I like. He said, “Well, I would like that life.” He said, “The only thing is, we could get a pub, but we would have to get married.” Well, that was the proposal.” [Laughter.] Yes, so, that’s how we always worked together, so. How did you work together from then? We did, we got married, and we went into the licensing trade. We had country pubs, and that’s all we ever did. I suppose I grew up in one, I had sort of … It’s quite a life I liked. I quite liked it, you know. Well, the first one we took was at Sheerness, on the Isle of Sheppey, called The Hero of the Crimea. [Laughter.] Very elegant name. Then we moved, and we had The Swan at Sellindge. Then we moved and we had one at Burham. Then we came back, we had one in Gillingham. That was the last one we had. Yes, we retired, but what we did do for a few times is we did the relief. When people were going on holiday we did the relief for two or three weeks. In our day, we didn’t do a lot of food, but then food started to come in, and I started to do food. I couldn’t believe … We never made an awful lot of money in our pubs. I mean, there was not a lot of profit then, but when food came in … For three weeks I used to do the food. I can’t believe the money. Well, we used to have a holiday afterwards, which we never had before. We hadn’t made that sort of money. I just liked the life, being busy. Well, like now, I’m okay all day. Evenings I want something to do because I’ve always been used to doing something in the evening. Of course, well, I still play cards a bit/ I don’t get out. I’ve stopped driving now. I stopped driving a year ago. How do you feel now and how did you feel then about losing your War Widows’ Pension when you remarried? I thought it was unfair. Well, I don’t know. I just thought they never appreciated the fact that we had been left because, at the end of the day, we had given up a lot, we had given up our husbands. I wouldn’t have minded so much if they had reduced it, but to stop it entirely … I didn’t think it was fair, no. I suppose the implication is that if you remarry you were no longer a war widow. Yes, exactly. I can understand that. I know when the liberals were canvassing one day in Littlebourne, they were against us getting the war pension back, the liberal party. It was well known. And this lady came to the door, and she was canvassing for the liberal party. She said, would I vote for them. I said, “Well, no”. I said, “I was a war widow”. I said, “You were one that, your party …”. So, she said, “Well, it was your choice wasn’t it, to marry again?” So, I said, “Well, perhaps,” I said, “I won’t go into details”. I said, “But really and truthfully, I had no other choice”. I was quite cross really to be told, yes. I know it was our choice, but what did they expect us to do? Of course, even if you remarry, that doesn’t change the fact that you lost your husband to the war. No, nothing would ever change that. Nothing. No. Nothing would change the fact that my children hadn’t a father. You said that your son and what you call your second family, so the family that I assume is attached to your second husband, you said you went to Italy several times? The first time we went, Bernard took me. It must have been about 1984, probably. So, almost exactly forty years after your husband pass away, your first husband? Yes. And Bernard, and his wife, and her mother, and I went to Italy. I can remember when we landed in Italy … Oh it was a strange feeling. Yes, very strange. Then I started to go with the British Legion tours, and they used to go all around the different cemeteries because Italy has got so many small cemeteries. So, I started going with them because I felt that you’ve got more in common with them, you know, and if you feel a bit upset. I didn’t like getting upset in front of the children. Wherefore, if you go with them, it’s not so bad. Then after a few years, we went out and we started staying in a castle, or a castile as they call it, but a castle we call it. It’s near Sao Paulo in Italy. And you get to this place and then you go on this track and you go up this, and you go round and round and round. It’s really right at the top. Beautiful, old, and apparently even got Roman ruins, part of it. What they had done, they had made it into apartments. We went out and the first time we went out, we had the apartment with the … one, two three … with five bedrooms. Bernard didn’t come that time that the second family all came out because they are very good, they always, especially my daughter, she’ll always arrange to go. She’s really very thoughtful. Then from there on we went there every other year, to there to that same place. Then Bernard came out one year. Bernard came and his daughter came with her three children and her husband. We had two of the apartments then, so we had more of the … But inside, it’s a place where you needed lots of family. It was really eerie in this place. They had these big photographs … pictures … And the children said, “I can’t stay in that room, that woman looks at me, nan. It’s awful.” All these big … Very Italian. The two men that ran it, they were so helpful, they would do anything for you. You know, if the cars went wrong, you could always go them, they knew exactly what to do. They used to look forwards to us coming every other year. They used to be out there waiting for us to come to them. The last time they went, I couldn’t go. I wasn’t well enough. But my granddaughter went, and her partner at the time, her father was a regular soldier and he got the wreath, special wreath to take out. They went out. Bernard has said you know, if I want to go out, just for a weekend … but of course I’ve got to get from here to my son, my other son. He would always take me from here to meet Bernard, but I’m getting to that age now where travel’s not …. Tim, my other son, he drove me all the way last time because I said, “I don’t feel like flying”. “Oh, I’ll drive you,” so he drove me there. If I said to him, “I would go to Italy, Tim, if you drive me,” he would drive me, but I don’t think it’s fair really, it’s such a long way. It is a long way. He might like road trips with his mother. Yes. Well, I’m sure he would do it. Even my granddaughter’s partner, he’s in the Army. “Oh, I’ve driven. If you really want to go, I’ll drive you.” Do I feel fit enough to go? I don’t know. – when you got off the plane. Why did you think that was? “I’m here, I’ve come”. It was something I had always said I would do, and I have done it. Because, I suppose, really, when the children are small, you’ve got to think of whether you can go, and, I suppose, the opportunity didn’t come. It wasn’t there then so much to be able to do it, you know. It wasn’t until I said to Bernard, you know, “Can we go to Italy?” Bernard said, “Of course”. Bernard can still go and does still go. In fact, there was a piece, I think it was [Jean-Claude] Juncker, that’s his name in the European … It’s Juncker, isn’t it? Something like that. He wrote something about us not visiting our cemeteries, or something. 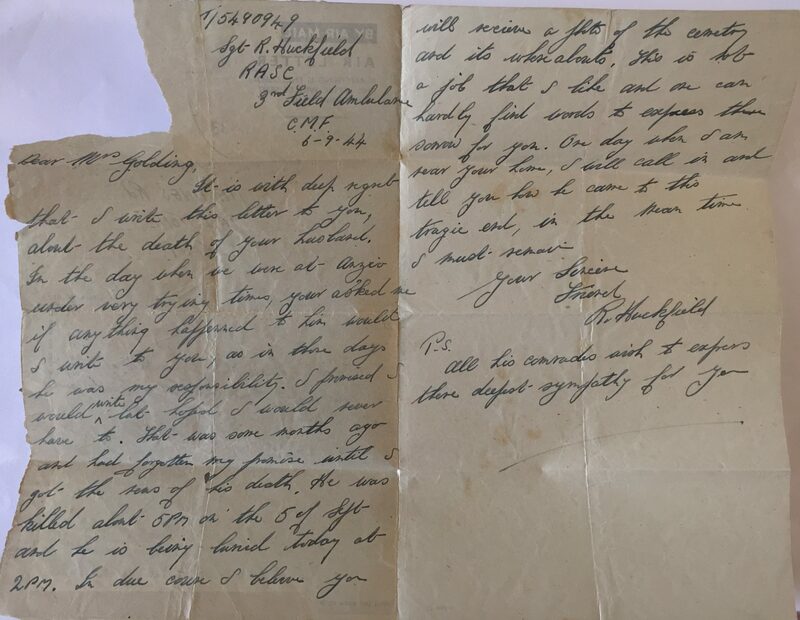 Bernard read that in the Telegraph, and he also wrote back to him to tell him we did go. We did visit, you know. He was quite upset to be told that we don’t visit our graves. It’s a very generalised statement to make, isn’t it? Yes. Well, it’s a sensitive subject really because well I suppose there is less and less people left now to visit, when you think about it. Well, it’s very sad really when you look at a cemetery like Florence. All the foreign troops that are there. Indians, there’s a large, large selection of Indians. You know, it makes you wonder if those people could or did ever visit because could they ever afford to visit? You don’t know. So, I don’t think he should make that remark. I didn’t join until the 80s. That was when my second husband died. I never thought it fair while he was alive because that was my life, but after he died then I felt that I could do all those things I had wanted to do, always wanted to do, and could then do without hurting anybody’s feelings. Because, I mean, you marry a second time, you cannot keep harping … It’s there, I mean he never minded. I mean, I don’t think he would have done, although he never brought it up. So, it was never mentioned. So, it’s not something you talked about? He hadn’t been married before? No, it was never ever brought up, not once. No. Well maybe there’s reasons for that, but he wasn’t one … I mean he never talked about my little boy, either. It was almost as though he had closed a door. He probably thought it was something that he didn’t want to bring up. Maybe he thought it was best that way, you know. I suppose different people look at it different ways. Oh yes, I knew everything. Oh yes, I did. I knew everything, and that’s why afterwards I joined the War Widows’ Association. Also, I used to go to the British Legion meetings, as well. I always did sell poppies. I always sold the poppies, yes. I’ve always gone door-to-door with my poppies. I think if you’ve got an interest you’ve got to follow it through, I think. I always thought, I don’t know, for those really more that’s injured than anything, because a lot of those that are badly injured do need an awful lot of support. I don’t think always that enough is said about them, you know. So, have you been going to Remembrance services? Oh yes. Yes. My daughter and her partner, we went to Canterbury Cathedral one year. It was packed, but I felt there were all these dignitaries all around here. We were wedged up the side here. I thought, I’m still getting as much respect now as I did the day he died, because it was almost … I’m more important than those … I’ve got more reason to be here than all those people sitting. We were literally … We couldn’t even see anything. We were just shoved up this side. But the village church is different, in the village. We go now, every year, we’ve been going because Harry’s name wasn’t on the memorial on the village he grew up in, which was Loose, near Maidstone, because we lived in Maidstone. But Maidstone has none. But Maidstone hasn’t got a name, not for … only for the Buffs [The Queen’s Own Buffs, Royal Kent Regiment] because that’s the Maidstone regiment. So, I started. I wrote to Loose Council and said that I felt as my husband had grown up in Loose I thought his name should be on the Loose memorial. He had gone to school there, he had gone to the church there, he had grown up completely there. Anyway, they were very helpful. It took about at least ten years to get his name on that memorial. It was all to do that you have to write to the synod, you had to do this, do that, do that, the other. Anyway, finally, three years ago, finally his name is on the Loose memorial. It’s a new one. There were three people that weren’t on that memorial. It’s in a little village, pretty little village, and church is sort of, it’s up a little, not by the church, very old church, not much space, but the cemetery is on the side where the memorial is. So now, every year, we go back to Loose, to the service there because his name is read out now every year when we go there, so. Bernard’s family, which is Harry’s grandchildren … It’s very strange: Harry had lovely auburn hair, and when my two children were [born], it wasn’t there. This lovely dark, almost red, deep hair. My children didn’t have it. Barry’s was blonde and Bernard’s was brown, more my colour. When the great-grandchildren came along, Bernard’s children, the grandchildren: no, not a sign of it. The great-grandchildren, there are three of them that have got auburn hair. Yes, and I said, “It’s a good job that I’m here to tell the tale because I know where that hair [comes from]”. So, it’s unbelievable, isn’t it, how the genes are still there. Of course, when I see them, their hair, I think, “Oh, that lovely hair”. Yes, it is because it’s almost unbelievable to come out in the latter children. Have you ever been to the War Widows’ [Association] Service of Remembrance in London? No, I can’t go up there. It’s too much for me to stand about. The British Legion put me across, and also the women’s branch have got a section. So, I have one there. My grandson, he works in London, a couple of years ago I said to him, “Paul, if you’re near Westminster, will you where the cross is?” I didn’t realise they were going to send me a map afterwards. They would send me a map to say where it was. Anyway, he said, he went, he said, “When I got there, I couldn’t believe it”. He said, “There’s this sea of crosses”, he said, and I thought, “I will never, never find this”. He said, “And I looked down, and it was there.” Yes, so he sent me a photo through. No, I would have liked to go, which I could have done, to the Albert Hall. Yes, but I couldn’t, I would blubber. I couldn’t go. I admire those women who sit there through it, but I wouldn’t because I would have made a proper, you know, I would have looked stupid. So, I thought, “No”. I could never sit through it, but I would like to go but I can’t go, if that makes sense. You feel it’s better for you? Yes. I mean even, you know, the march past, I’ve always thought I would love to do it, but I couldn’t, yes. But I do admire the people that do because I mean, some of them are not fit you know, they do do it. I’ve been there once, with Bernard one year. We went up and we got quite close to the Cenotaph. It was quite an experience, yes. What are your thoughts about war widow’s today, Bernice? I know you said when you said you went to Canterbury Cathedral and you felt like, oh, people were paying as little attention to you as they had been in the 1940s. I think today that they are looked after far better. And so they should. I mean, they make sure they have a house to live in. That they’ve got a decent pension. I mean they should be looked after because it’s not something that is easy to take, really, because you are young people. We hadn’t been married 40 or 50 years. I mean we were married, Harry and I were married for four years. I mean they’ve taken away our young life, really. And I think today that, yes, they should look after them and make sure the children, as well. Yes, I really do. I realise I’m jumping a bit now, but I just realised I had forgotten to ask you something. We were talking about you being aware of the War Widows’ [Association’s] efforts, even before you joined, so you were aware of what was happening in the 70s. So, what made you join when you did, after your second husband’s death? Because I suppose it was something … I don’t know, you’re clinging on somehow. It’s unfinished, something. I don’t know, it’s something, I think you’re still clinging on somewhere, I think. I don’t think you ever really let go, to be quite honest, because probably you’re just told your husband is killed, that’s it. Nothing else. That’s it. And I suppose you still cling to that, I think. What were you hoping for when you joined? Just to be a part. Just to take part really. Yes, because, as I said, I think I was just carrying on where I thought I should have been in the first place. I mean, I suppose when I joined, I mean I was still very busy because when my second husband died, while I’m living in Littlebourne I came to look after my daughter’s three children. She went back to teaching, and there was a five-year old, a three-and-a-half, and a baby. So, I came to look after them. I think at that time I was very, very busy, but I still wanted to join all of those things, but I didn’t have the time then to go. Although there’s not much in meetings … Apart from the British Legion, I used to go the meetings in the village. To the British Legion meetings. I don’t know of any other, I don’t think there are any associations in this area to be quite honest. I mean when I look through their [the War Widows’ Association’s] book, they’ve got quite a bit going on in different places, but you don’t find Kent really. There’s not a lot going on in Kent. Maybe north Kent, which is quite a way away really. I mean they have a lunch that they used to do, but it was quite a journey, you know, even when I drove it would have been quite a journey to drive, you know, but. Were you aware that when you first got your war widow’s pension after your first husband died, were you aware at the time that it was taxed at 50%? Yes, Margaret Thatcher did that, yes. She was the one who abolished the tax finally in 1979. Yes. How did you feel about it at the time when you knew that 50% of your War Widows’ Pension … ? I was quite grateful actually because my husband never having gone to work as such, we didn’t have a pension from work pension. So, when I was left, I just had the basic pension. So, I was quite grateful for the fact that I had got a decent pension. Seemed to be strange, in a way, that you got it then, I suppose. I think, I don’t know. It still seems strange sometimes because it was too … The help came too late really. We should have been helped earlier. I mean that’s what I always felt. I just felt that we were just forgotten I suppose, really. You know, we had to make our own way with very little money, you know, and it was little money. – because it was [classed as] an unearned income. Oh yes. Yes, it’s incredible when you think back. I’m pleased that it has changed now because it’s still of an interest to me that, you know, when I see … I mean, it’s terrible that men are still being killed, and have been. My grandson went to Iraq twice, to Afghanistan three times. I don’t know what I would have done if anything had happened to him. It would have been terrible. But he wasn’t married. When he joined the Army …? No, he went into the [Royal] Air Force. He was in there for eight years. He’s out now. He works in London. But no, there are a lot of young widows about with children and they need assistance. I mean alright, probably people think, “Well, you marry again”. Maybe you do, but you haven’t abandoned your first marriage. You haven’t abandoned your children. You’ve still got them. Also, you’ve got the life that you could have had and you didn’t have, you know, because alright it was my choice to get married young, but I do think that my youth was robbed because being left a widow and left at twenty-one to fend for myself with no man in the background. I mean and you don’t realise until they’re not there that you are so much on your own, you know. How did it make you feel when your grandson joined the RAF? I don’t know whether the Iraq war was on then when he joined. I can’t quite remember, but I do remember listening to the news one day and they were supposed to not be able to reach the airport. And the news that they had sent … they had shelled the airport. I thought, “Paul, oh my god”. You know, “Paul’s there”, and he lost two of his mates. No, his mother was, oh gosh, she was nearly a nervous wreck, my daughter, yes. I can’t quite remember. I probably thought, well it’s something. I mean my two granddaughters took both of them with soldiers now, long-serving soldiers, I mean that’s their career. That’s what they do, you know. Both men have been to Iraq and Afghanistan, but I just hope we don’t get involved anywhere else. I think we’ve learned our lesson maybe to stay away. We can’t sort out the world. You said in the very beginning that when you got the letter that your first husband was killed in the war that you never think it’s going to happen to you. Do you think that’s what your [grand]daughters are thinking? You said they are both with long-serving soldiers. Probably. Well, there isn’t a war, is there, at the moment. Although, my granddaughter, she was with him when he went to Iraq, so the war was still on then. He was gone for six months. The only thing is now they’ve got their mobile phones. You have contact, you see, and that makes an awful lot of difference that contact. I mean he used to be able to ring her from Iraq, even with the war going on. So, she sort of knew, still had contact, which we didn’t have. All we had was a letter, which sometimes was held up. I had got a parcel for Harry. I was getting this parcel to send for him … some chocolate, which was on ration, and all sorts of things in this parcel which I sent out to him. It arrived the day after he died. I always felt, you know, it seems so awful that he never got that. Because a lot went into that parcel to send him and he never got it. Do you remember what you put in it? I know it was chocolate, and I think it was some toiletries … things that I knew that you couldn’t get, and even I had difficulty getting at the time. Also, we were growing tomatoes in the garden. I sent him a little tomato in there that we had grown. And the officer, when he wrote, he said that he had distributed it in the hospital. But that was no consolation to me because he never knew that. We went to all that to send him that nice parcel and he never got it. So, one thing we glossed over a little bit, Bernice, is that it sounds like you have children with your second husband. Could you give us a little family tree of what your family looks like now? Now? Yes, there’s Tim. He’s the eldest, then there’s Susan, and there’s Jennifer. These were with your second husband? My second husband. With Bernard, I have three grandchildren. Three … eight great-grandchildren. With Tim, Tim has no children. Susan had three children, and I have one great-grandchild there. And Jennifer had two girls, and she has two grandsons. So, I have four children, eight grandchildren, eleven great-grandchildren and I have one great-great-grandchild, and that’s the photo … I’ve got a photo up there with all the generations. So, you have a very big family now. Yes, I’ve got a lot of family. Yes. It sounds like you see them all regularly? I do see them. I always see Susan on a Sunday, and if Susan’s away, ether Lucia or Anna Marie, her daughters, one or the other, will come and we’ll go for a meal or something. Jennifer always comes on a Tuesday. Tim comes down every so often. Or he’ll come down and take me up to stay with them. Bernard’s coming June 10th. And his daughter from Ireland’s coming over. She has three children. She unfortunately has lost her husband. And his other daughter, who lives in America, she was over last year, and she obviously came to see me. They all come to see me, yes. Oh yes. I think they think I’m going to be here forever. If I say anything to Lucia … I said something one day and I said, “Well, I might not be here”. So, she said, “Why granny, where are you going?” I don’t think they can’t see the day they haven’t got me around”. I don’t come from a long-living family, no. That’s wonderful though. It sounds like you are all very close. Oh, we’re very close. Very, very close. Susan, they have a boat. We go down there and she does lunch. Every now and, again, the whole family get together down there. We all meet, usually on my birthday they all come down. The two families get on very, very well. The cousins all love to meet. There’s no hard feeling anywhere in our family. To me, I love it. I love to see the grandchildren, and the cousins all getting together. So, when you’re not seeing your big family, what else does life hold these days? Well, I do get out to have a game of cards. I go to whist drives. I go to bridge drive. Now, I have to rely on a lift because, as I said, I let my car go a year ago. I might have been a bit hasty, but I don’t think I was. I think I was coming to the end. I didn’t want to be one of those people that have an accident, and I thought, you could do at my age. You know, you could have a giddy moment or something. But now I rely on lifts, and on a Wednesday afternoon I go and play bridge, and there’s a chap that I know who used to run a whist drive, and he comes well out of his way to come and pick me up to take me into Canterbury. Thursday night there’s a couple who live in Dover. They come right out of their way to pick me up to go to crib. I’ve known them for years. I knew them when their children were little. Then, locally, there’s a lady who gives me a lift, but if she’s away there’s another two people who come. They live in Herne Bay, which is out of the way, and they will come and pick me up. I do rely on being picked up now, but if I can I go out for a game of cards. Sometimes, on a Saturday, if I know I’m not going out and I think it’s going to be a long … I would go on the bus into Canterbury, and just do a little bit of shopping, just round where the bus is. Then, if I feel ok, I will come back on the bus, but if I don’t I will get a taxi and come back. But I do get out. Friday afternoon I walk down to the village. They have bridge in the village. They have bridge, which is quite nice. But I’ve always been one to get out. I’m not very good … I’m not a granny that sits in the corner doing her knitting. I’ve never done that. But you’re not going dancing anymore? No, I don’t dance anymore. No, that went with my youth, I’m afraid, the dancing. Bernice, is there anything else that you would like to talk about, anything more you would like to reflect on that we’ve not had a chance to talk about? No, I don’t think so. I don’t know whether there’s anything I’ve left … I was going to show you [the letters and photographs] … They might trigger something, but I don’t think so. This is the letter that came from the sergeant to tell me he had died. Right, so this was the first. That’s the letter that told me he had gone. This might be a bit too difficult, and tell me if it is, but would you like to read it for us? – I think that says. “I promised I would, but hoped I would never have to. That was months ago and had forgotten my promise until I got the news of his death. He was killed about 5PM on the 5th September and he is being buried today at 2PM. In due course I believe you will receive … a photo of the cemetery and its whereabouts. This is not a job that I like and you can hardly find words to express my sorrow for you. One day after I am near your home, I will call and tell you how you how he came to this tragic end. In the meantime I must remain … ”. “All his comrades wish to express their deepest sympathy”. That was the letter I got. No, he never came. No. Well, you see I moved away, probably, so. And this …Bernard used to scribble over everything. He was writing to his Daddy. That’s … everything …. Bernard writing on everything. “I must apologise for not writing to you before this, but circumstances have prevented my doing so. However, I do want you to know how sorry I was to hear of your husband in such tragic circumstances. He was one of my best motorcyclists and has [done] some excellent work at Anzio, especially he was most valuable and could carry out his duties in a manner above reproach. I can assure you that he is missed, not only by myself, but all the RASC chaps here. 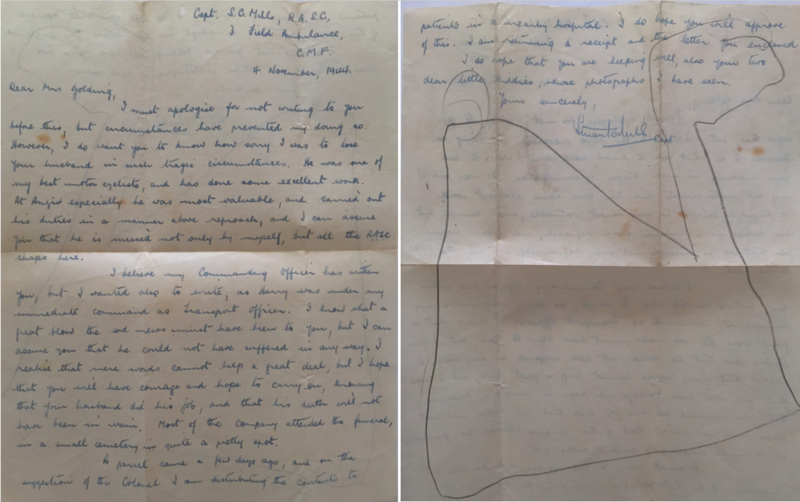 I believe my commanding officer has written to you, but I wanted to stop to write as Harry was under my immediate command as transport officer. I knew what a great blow the news must have been to you, but can assure you that he could not have suffered in any way. I realise that mere words cannot mean a great deal, but I hope that you will have courage and hope to carry on looking at your husband did his job and that his death will not have been in vain. Most of the company attended the funeral in a small cemetery and in quite a pretty spot. A parcel came a few days ago and, on the suggestion of the colonel, I am distributing the contents to the patients in the nearby hospital. I do hope you will approve of this. I am returning your receipt and the letter enclosed. I do hope that you are keeping well, also your two dear little boys. Their photographs I have seen”. That was … I don’t know what his name is. I think it says it on the front, doesn’t it? Is it S. C Mills? So, this came a couple of months after your husband passed away. He says he enclosed the letter that you sent with the parcel. Did you get that back? Yes. All his letters came back. Have you still got that one? No. I’ve only kept one letter. I went into hospital, and I got rid of all my letters. I didn’t want anyone else to read them. I kept one, yes. Just for me. One. The one with the poem he wrote. I don’t know where that is. He wrote a poem he had done about Anzio. The last words were, “once a year at Anzio time” … something … . “Remember once a year at Anzio time, the one I love so dear”, or something to those words. That’s the one you kept. Yes, I kept that one. Yes. Do you want to show me what’s in these? Yes. There’s not a lot in here because it won’t interest you, because this is Bernard’s, all Bernard’s stuff. For Bernard, our sort of family. That was his will that he left me, but … . Oh, that came … In the war, we had some little wooden trains came for the boys from Australia, and that was the letter that they sent from Australia. They were for children who had lost their father’s. They said they were making these toys. Did your boys like them? Yes, well, they were really nice little wooden trains. Of course, I wrote to them when they got their toys. They did, they sent a parcel. It was tinned butter and some jam, I think, something like that. Were you glad when the food and the train had arrived? Oh yes, because it was so monotonous. – if you like. So, that came not too long after you husband died. No. And of course it came from Loose, where Harry grew up. I think that’s all I’ve got in there to … . So, it’s literally a form of blanks. It doesn’t say your name. No, it’s just fill in the options, wasn’t it. Yes. But it was “Madam”. I was his wife, at least they could have said that, you know. Very interesting and moving account. Many thanks to Bernice for sharing her story with us and to you for sharing it here.